If you are teaching on a new module, you can send your list to the Library using the online submission form and we will create it for you. Alternatively, you can use the instructions below to create your own reading list. If you'd like 1-2-1 training on how to do this yourself you can contact lib-readinglists@york.ac.uk or your Academic Liaison Librarian. 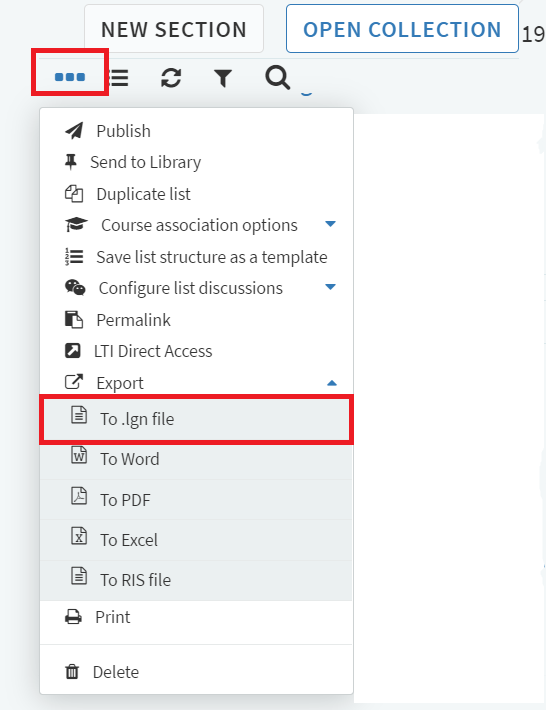 To create a new reading list you will first need to access your module site in YorkShare (the VLE) and locate the Reading Lists link in the left hand menu. If it isn't there see the Tool Link tab for instructions on how to insert it. Click on the Reading Lists link to open the system as an embedded window within your module site. If you want to create a new reading list for this module then click on 'create it'. Give your list a Title (e.g. "Global Geographies: Autumn Term Reading" and Description (optional), then click Create. At this point you can choose to create a blank list, or use the Weeks 1-10 template, which will help you structure your reading by creating sections for each week of the term. This template is also useful for the Library, as we can prioritise orders and digitisation requests for your list more effectively. If you choose a blank list you can structure the sections in whichever way you would prefer. If there is a different template that you or your department would find useful then please contact lib-readinglists@york.ac.uk. Note that it is possible to create lists that aren't attached to a particular module. Access Reading Lists via one of your VLE modules and then select My Lists. Click on + NEW LIST and this will allow you to create a brand new list. If Reading Lists doesn't appear as a menu option in the VLE module menu use the instructions below to add it in. Click on the + icon in the top-left corner, then selecting Tool Link. Add "Reading Lists" as the link name and select Reading Lists from the Type dropdown menu. Tick the box for Available to Users and click Submit. The Reading Lists link will now appear at the bottom of the menu. When creating a new list you will first be asked to associate it with a module. Click Associate List and type in the module name or Yorsearch code (beginning Y2017-) to view a list of your matching modules. Amend the module dates and student numbers (if required) then click Associate. You can remove the module association, or associate your list with a different module by clicking the list options icon ⋯ in the top left corner, then clicking Module association option. These options can also be accessed from the My Lists page. Note that you cannot associate a list with more than one module. If you wish to have the same list on two different modules you will need to create a copy of the list. When you are using Reading Lists in the VLE, the VLE menu on the left-hand side of the screen will disappear. This is to avoid any possible confusion caused by having two different navigation menus. This will create a copy of the list (in draft status) which can be assigned to another module if required. If you are joining the University from an institution that uses the same Reading Lists software as York (Ex Libris Leganto) then it is possible to migrate lists using the .lgn format. To download your list select the menu button and choose export, from the drop down menu select To .lgn file. To upload the file in Reading Lists select New List and choose the Import .lgn file option.